This Spotted Black Crow was feeding at the flowers of the StringBush at the Butterfly Hill on Pulau Ubin last weekend. It appeared to be very hungry and continued to feed for over half an hour, moving from flower to flower of the bush. 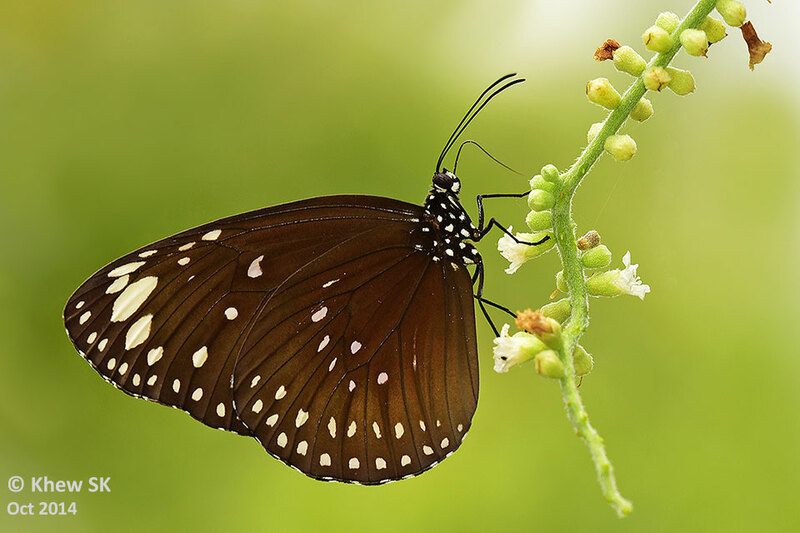 A moderately rare species, the Spotted Black Crow's caterpillar has been successfully bred on Gymnanthera oblonga (Sea Rubber Vine) and Parsonsia helicandra from the lactiferous family of plants Apocynaceae. The Spotted Black Crow flies slowly when undisturbed, and is sometimes observed puddling at sandy stream banks in the nature reserves. 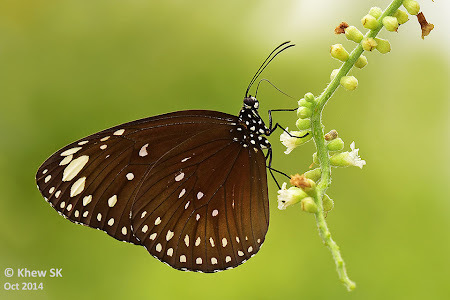 A closely-related species, the Blue Spotted Crow (Euploea midamus singapura) is very similar in appearance but has more squarish subapical spots on the forewing and lacks a small spot at the costal area of the forewing.